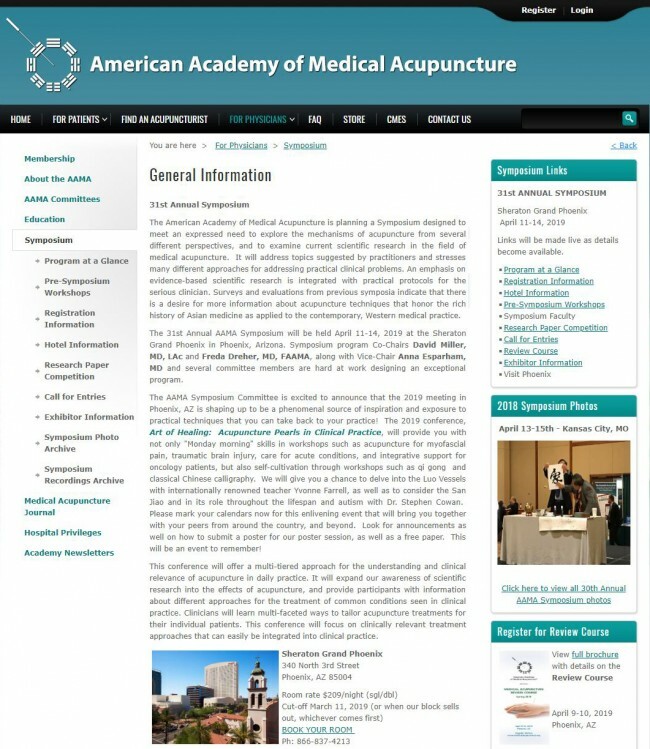 The American Academy of Medical Acupuncture is planning a Symposium designed to meet an expressed need to explore the mechanisms of acupuncture from several different perspectives, and to examine current scientific research in the field of medical acupuncture. It will address topics suggested by practitioners and stresses many different approaches for addressing practical clinical problems. An emphasis on evidence-based scientific research is integrated with practical protocols for the serious clinician. Surveys and evaluations from previous symposia indicate that there is a desire for more information about acupuncture techniques that honor the rich history of Asian medicine as applied to the contemporary, Western medical practice. The 31st Annual AAMA Symposium will be held April 11-14, 2019 at the Sheraton Grand Phoenix in Phoenix, Arizona. Symposium program Co-Chairs David Miller, MD, LAc and Freda Dreher, MD, FAAMA, along with Vice-Chair Anna Esparham, MD and several committee members are hard at work designing an exceptional program.